William John Eric Mitchell, known as Eric, was born 24 January 1895 near Greytown, the son of William and Jessie Mitchell. On his army record he claimed to be born five years before that. His father William was a shepherd and by 1900 was living at Pihautea. He was on the Kahutara School committee in 1902. Eric began school there in 1900 and his sister Alice started school in 1904. How long Eric remained at school is unknown but most children were working by the time they were 13 or 14 years old. By 1914, when he enlisted, Eric was working as a slaughterman in Waikari, North Canterbury. His father had moved to Methven, also in Canterbury. Eric joined the army on 3 September 1914, with the service number 6/1106, and trained in Christchurch with the Canterbury Infantry Battalion. 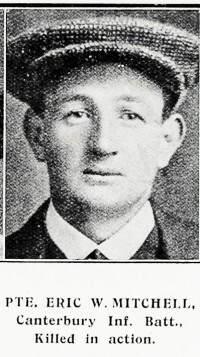 He went overseas with the Main Body, leaving Wellington on 16 October 1914. The Main Body of the N.Z. Expeditionary Force, 8500 soldiers and 3800 horses, sailed to Egypt. They trained there for four months. In April 1915 the infantry sailed to the island of Lemnos, setting up a base camp for the Gallipoli Campaign. On 19 April Eric went to hospital there for three days, with influenza. He rejoined his battalion on 22 April and would have landed at Anzac Cove on 25 April 1915. Nothing more is known about his time at Gallipoli until his death on 7 August 1915, as the Canterbury Battalion climbed the hills towards Chunuk Bair. The battalion became lost on the night of 6/7 August and arrived late on Rhododendron Ridge, the jumping off point for the attack. Eric’s body was not found and his name is on the Chunuk Bair (N.Z.) Memorial at Gallipoli.